Fall is finally in the air and there is alot happening around here! First off, I'm sorry for not keeping up with this monthly newsletter lately, but I do have a good excuse. We just welcomed another member to our pack, our second son Conner. Here he is chilling on the couch with his big brother Disco. Fur sister Marley and brother Justin are also adjusting well to the changes. I'm also excited to announce I've been working on creating a Maltese ebook. I noticed that there are no specific Maltese ebooks out there, so I'm creating one myself. I'm a professional Maltese dog lover and have learned alot over the years by having two of my own Maltese as well as getting feedback from the entire Maltese dog lover community through my website. I want to include the best, most relevant information in this ebook. Tell me what you want to know about Maltese and I'll enter you in a drawing to receive a free book. You'll also get a discount once the book is published. Not a subscriber yet? Like what youve read? Sign up to get future issues delivered straight to you. This sounds like it might be frustration aggression. Dogs are emotional animals just like humans. In the same way you might snap at someone or get angry easily when you're frustrated, so do some dogs. 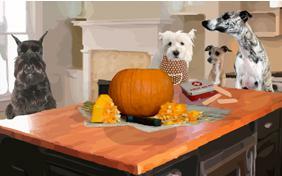 Check out this cool site Doggyloot where they feature a dog deal a day. Kind of like Groupon for dogs! This month's great Maltese blog is from Tessa the Maltese. Read about the adventures of Tessa, an awesome Maltese who is a Registered Medical Assist Service dog for her Mom who is disabled. Don't forget to leave a comment on her blog to let her know how much you appreciate her service! Know of any cool Maltese dog blogs? Tell me about it! Want to keep your Maltese a lovely bright white color? Try Chris Christensen White on White, it's highly recommended by other Maltese Maniacs. Let me know how you like it if you give it a try! 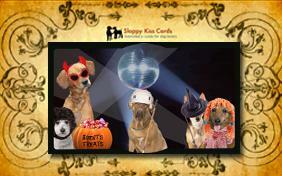 Here's a cute and inexpensive way to say "Happy Howl-o-ween" to the dog lovers in you life. Sloppy Kiss Cards has a huge collection of animated ecards that can be customized with different dogs and of course there is a Maltese to choose from. It's only $13.95 a year for unlimited cards for all occasions. I've joined and use them all the time, especially for friends' birthdays. 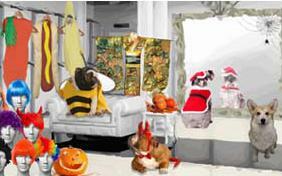 Join now and send an instant Howl-o-ween ecard. Know of any cool must-have Maltese dog products? Tell me about it! "The more I know about men, the more I like dogs." Southern Comfort Maltese Rescue (SCMR) is a Maltese dog rescue dedicated to rescuing and caring for Maltese and other toy breeds in the Southern US states. Their most recent rescue dog Dino is in need of your help. Click here to see how you can make his life better. You can also join them on Facebook for the latest news. Dog Memorials - Share your Maltese dog memorials and read about other Maltese dog rainbow bridge stories. Keep Up-to-Date on All Things Maltese! Connect with over 1000 Maltese dog lovers, submit pictures and videos, and brag about your little ones. Learn about the latest Maltese dog news, web pages, and user submitted stories as soon as it breaks. Know whenever any new web pages appear on Maltese Maniac, such as user submitted stories and photos. 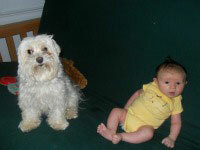 Watch funny dog videos of the Maltese Maniac mascots Marley and Disco in their everyday adventures. I'm constantly adding new content to the site and would love to hear any feedback, good or bad. Please don't hesitate to contact me. P.S. - If you find this newsletter useful, please feel free to recommend it to a friend. Let's continue to grow the Maltese Maniac community together!